An essential live recording revealing a powerful moment in Steve’s live performance history. An extended set of sacred sonic spaces and immersive atmospherics embrace the senses within the expanse of San Francisco’s Grace Cathedral. 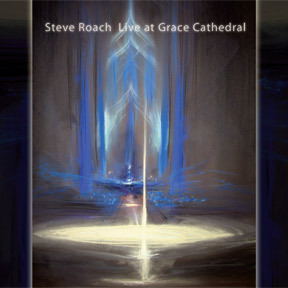 In Steve’s words: “Performing at San Francisco’s Grace Cathedral was a dream come true in many ways, and a high point in my live performance memories over the last decade. It’s a fitting release to commence the times. This will be the first live recording I’ve released with the natural reverberant sound of the performance space predominant in the mix. The expansive reverent ambience of Grace Cathedral is the perfect environment to experience this music within. To honor this space, I built a set that offered options to directly respond to the unique acoustic properties I knew I was heading into. The influence of the massive space and the spirit it contained were unseen collaborators holding the music and all of us in a dynamic embrace. From my performance location, I could hear and see the sounds constantly blooming outwards in the space hovering above the audience, collecting energy and then receding away within the expanse of the cathedral. I would spontaneously respond to this sense by shaping, carving, holding and releasing the music back into the void as the night evolved. Merging with Grace indeed.